Cover a baking dish with aluminum foil and place the peppers in it. Sprinkle some oil and a pinch of salt over the peppers. Bake on each side until the skin is wrinkled and brown in color. Remove the peppers from the oven and peal the skin off completely, along with the seeds. Cut the peppers into long strips and set aside. Mix the cream in a pan at low heat with the salsa verde and part of the pepper strips. Remove from the fire when the mixture thickens. Add the shredded cheese and let melt in the mixture. Add the rest of the peppers. Serve immediately, sprinkle with chopped cilantro and serve with hot tortillas or corn chips. You can save time by using pre-roasted canned peppers. 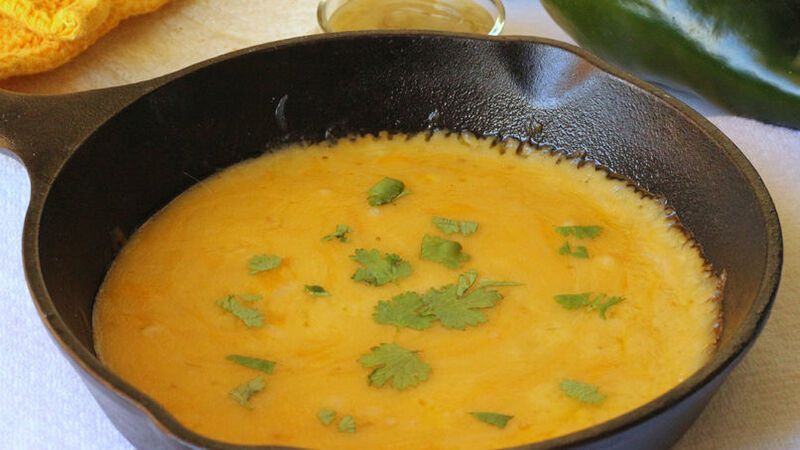 Queso fundido is one of the best Mexican appetizers. It’s impossible to resist the intense flavor of melted cheese and spices. Preparing it may seem complicated, but it’s surprisingly easy. Now that I know how to make it, you can always find it at our celebrations or as a snack before dinner. You can combine different ingredients like chorizo, tequila or jalapeños. The one I’m presenting to you today is a wonderful combination of poblano peppers, green sauce and, of course, tons of cheese!